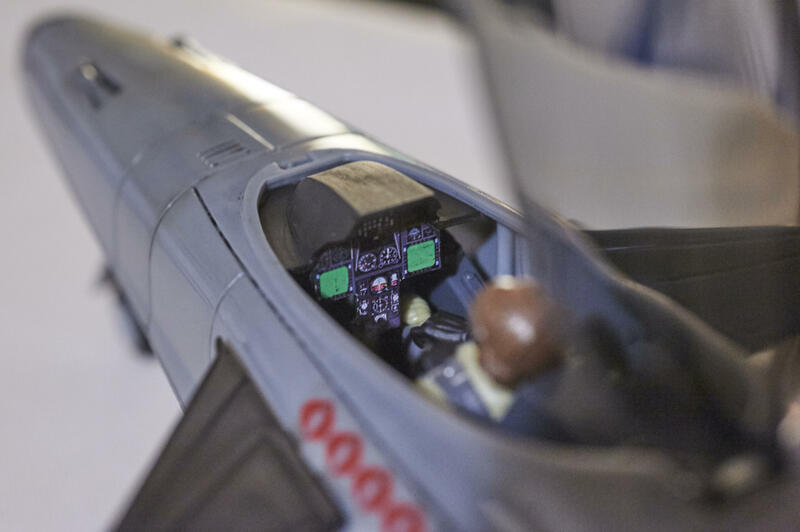 Hisstank member Henchman 21 created an instrument panel for the Target Conquest X-30 he scratchbuilt with styrene. It’s the little details that make a phenomenal custom. I always thought the X-30's cockpit was, for its length, poorly detailed. (Like, they could've put an instrument panel in the tub, or molded a hood into the upper body part itself. Because I have TOO MUCH STYRENE laying around, I got bored today and slapped together a new instrument panel and hood for the cockpit. I had planned to just white-glue it in place (attaching it to the underside of the nose) but the sprue I'd attached to use the third hand while I painted it turned out to hold it in place really well just from friction, so I reinforced that and now it's in place, displaying all the flight data Slip Stream could ever want, and it doesn't look like he's just using a jacuzzi at 80,000 feet. Where did the image for the sticker/decal come from? It’s a photochop of a couple different illustrations of an F-16 instrument panel, arranged to fit. (I’d have to look up what block it was). Printed in photo paper and glued in place. Looks awesome. I don't have any experience with styrene. I just used an extra Skystriker dash to make my Conquest interior. I like what you did better as you didn't have to take from another vehicle like I had to do.